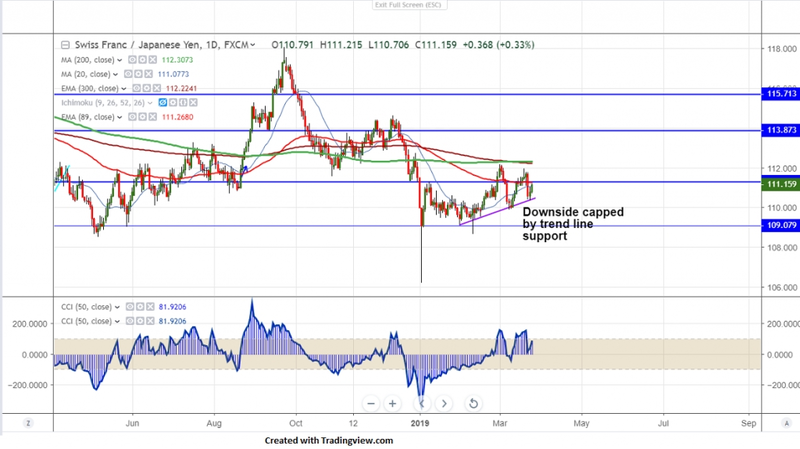 As per our analysis CHFJPY recovered sharply from yesterday’s low of 110.36 and jumped nearly 75 pips.It has lost more than 150 pips from temporary top 111.95 made on Mar 20th 2019. The yen was trading higher for past two trading days on declining US bond yield. US 3 month yield has crossed 10 year for the first time since 2007. The pair hits intraday high of 111.18 and is currently trading around 111.17. On the higher side near term resistance 111.27 (89- day EMA) and any violation above will take the pair to next level till 111.95/112.20. The near term support is at 110.80 and any break below that level will 110.35/110. It is good to buy on dips around 111 with SL around 110.60 for the TP of 111.95/112.20.